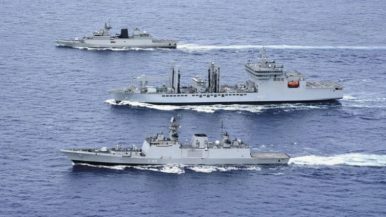 Indian Navy ships participating at Exercise 'Malabar' 2018. The trilateral naval exercise has grown in complexity over recent years. This week, the Indian Navy, the Japan Maritime Self Defense Force (JMSDF), and the U.S. Navy will conduct this year’s Malabar naval war games in waters off Guam for the first time. The 22nd edition of the annually held naval exercise will take place from June 7 to 16 off the island in the Western Pacific and will be divided up into two phases: a harbor phrase that will occur at Naval Base Guam from June 7 to 10, and a sea phase from June 11 to 16. The Malabar drill initially began as a joint Indo-U.S. naval exercise in 1992. After a suspension from 1998 to 2002, due to India’s nuclear weapons tests in 1998, the exercise has been held every year since. Japan became a permanent participant in 2015. Notably, like in 2017, India once again refused Australia’s bid to participate in the 2018 iteration of the drill. In the past years, the naval exercise has mostly taken place in the Indian Ocean region, including the Bay of Bengal. The exercise has grown in scope and complexity over the years. “The exercise will feature both ashore and at-sea training off the coast of Guam in the Philippine Sea,” the U.S. Navy said in a statement. U.S. Navy forces will include USS Ronald Reagan, the only forward-deployed Nimitz-class supercarrier, the Ticonderoga-class guided-missile cruisers USS Antietam and USS Chancellorsville; the Arleigh Burke-class guided-missile destroyers USS Mustin and USS Benfold; a Los-Angeles-class nuclear-powered attack submarine, as well as one P-8A Poseidon maritime surveillance/anti-submarine warfare (ASW) aircraft. The JMSDF will participate with the 19,000-ton JS Hyuga — the lead ship of the Hyuga-class of helicopter carriers; the Takanami-class guided-missile/ASW destroyer JS Suzunami; the Akizuki-class guided-missile destroyer JS Fuyuzuki; and a diesel-electric attack submarine, as well as one Kawasaki P-1 maritime patrol aircraft. 2017 saw the participation of the helicopter destroyer JS Izumo, the lead ship of the new Izumo-class, and one of the JMSDF’s most capable ASW platforms currently in service.